Remember that the idea for this car started back in 1998 before there really was a centrifugal solution... only the roots/Eaton style blower was available. The important premise for me was to do something different. The fastest FWD Honda's are turbo charged... and have been for many years. I wanted to forge a new path, not follow the long list of who's who that have already been successful with that application. The new Rotrex traction drive is not truly centrifugal... more of a hybrid, but it is still driven within a linear RPM framework. The traction drive improves the lower RPM output compared to the centrifugal... still not as efficient as the roots style... and then FAR more efficient up top compared to the roots. The power delivery is extremely linear... traction on the street is more controllable than a typical turbocharged car with similar power... unless the turbo car is equipped with BBG... which you and I both know drops the turbo car's output to meet the traction limits... so ultimately, power to the ground between both applications would likely look similar if you could graph it. Most importantly to me was being remembered for blazing the trail. Everybody knows who the first man to step foot on the moon was... but can you tell me who was the 5th without Googling it ??? Yeah V8's make more sense. You dont have to go to the end of the earth to make 500whp lol. I gotcha. I see these working alot better on K series. Working "better" on the K-series is merely because of the ability to easily create a larger displacement platform over the "B" series engine. Remember that I don't have to rev mine to the stratosphere to make 500+ wheel HP... I can pulley it up and make it at 7500 if I choose. This simply means that it will make more torque all across the powerband, and that was a concern for me with respect to traction, so I purposely used a pulley size that makes peak power late. Come on down and I will book you some seat time !!! Man - that thing maxxing out revs to around 9k with an AWD conversion would be a problem. You wouldn't have to worry about torque production down low. Subscribed! Baby J !!! Welcome to my thread. Stay tuned. ^ Ha ha - that moment someone calls you by your nickname. #wegowayback You DEFINITELY have my attention here. 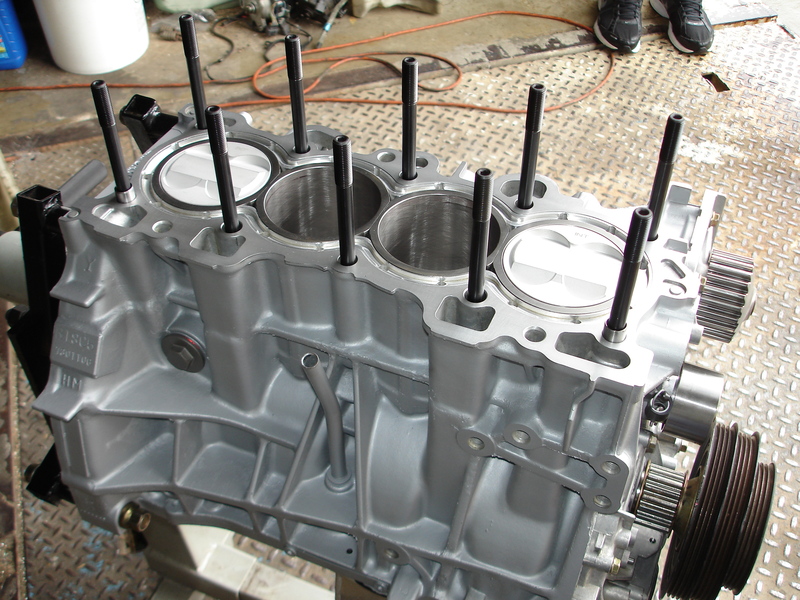 Ok, it is time to bolt that pretty cylinder head on. First I installed a set of AEBS head studs, then a Cometic head gasket, and finally the washers and nuts. Torqued the nuts down in three steps: 30 ft/lbs, 50 ft/lbs, and then 80 ft/lbs. Wow. looks good. I feel like I'm watching a chef in the kitchen bringing together a masterpiece. 'add a little of this.. a tad of that... 3/4 tsp here, pour this, carefully stir, wait..' SIMMER TIME! Ok, this is the part where there will be a lot of "story telling" without any pictures... the darn camera broke !!! I degreed the BC stage 2 cams according to the cam card. Valve adjustment was set at .006"/.008" for Intake/Exhaust respectively. 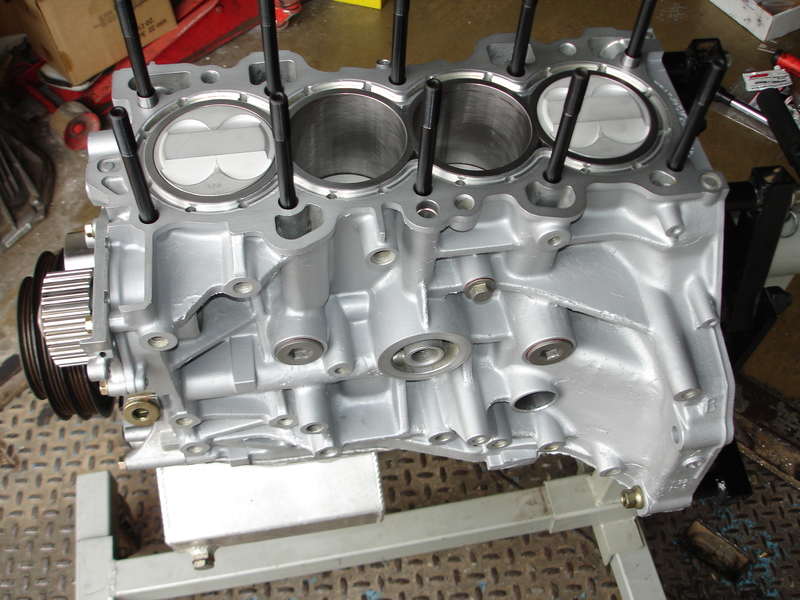 Final assembly of the long block was done on the engine stand. 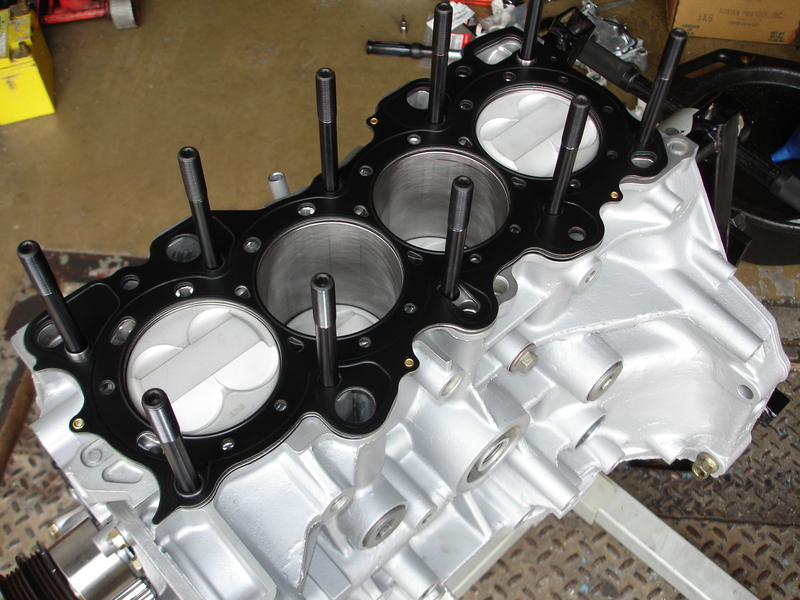 On the induction side, I used an Edelbrock Victor X intake manifold with a matching Edelbrock 65mm T/B. I also used the Edelbrock fuel rail because of it's unique design with respect to the location of the FPR port. It is a shame that these are discontinued... it really is a quality piece. My fuel injector choice was a set of Deatschwerks 1300cc. Before bolting all of this to the cylinder head, I happened to sneak a Hondata thermal intake manifold gasket in between. I did use a set of longer intake manifold studs for proper torquing of the intake manifold nuts. On the exhaust side, I used the custom designed HyTech header that I had on the previous engine. It is a short runner 4-1 design... big primary tubes with an anti-reversion step and a burns collector. The exit side of the collector is 2.5", which concerned me in that I hope to make 500+ wheel HP on this combination, and I don't want the header to hold me back. Once off the engine stand, the Tilton twin disc clutch and flywheel was installed. The brand new GSR transmission is equipped with a Quaife Limited Slip differential and the 5th gear pair has been swapped in favor of the taller LS ratio for better highway cruising fuel economy. Who re-worked that header? I have a RMF Narrow that I need massaging and bought back to life. Now that the power train is assembled, it is time to set it in the car and get some break-in miles on the engine. Breaking in the engine while N/A seemed like a great idea for two reasons: First, I wanted to get before/after dyno results so that we can really see what the supercharger will add. Second, I didn't want to be tempted to beat on the car while doing the break-in... after waiting nearly eleven years to get this back up and running, I am excited and don't trust myself !!! So, I set the power train into the engine bay. I installed a set of HASport 62A engine mounts and deleted the torque mounts. The radiator choice is an aluminum C&R dual core with a slim line fan. I also acquired a set of rare Samco Arctic-Digital-Camo radiator hoses, so I used those with my Python hose clamps to seal them up to the engine. Fluids used for this car are as follows: Honda MTF for the transmission, Mobil1 Synthetic 5w30 high mileage for the engine during break-in (high zinc content here... it's good for metal), and Genuine Honda Type 2 (blue) coolant to keep things cool. Break-in mileage and the N/A tune will be done on pump gas. I wanted to change the old venerable Walbro 255 lph fuel pump with a new Deatschwerks DW330. I pulled the pump assembly bracket to make the swap, and found my original fuel tank to have MAJOR rust issues all over the floor and within the sump area. NOT GOOD !!! So, I ordered in a fresh tank. I coated it with some under-coating and mounted it up in the original location. The fuel pump install went without a hitch after that. I poured in two five-gallon gas cans of Shell Premium V Power Nitro+ 93 octane fuel. I removed the ECU and back-up fuses in the under-hood fuse box and turned over the engine for three 15 second bursts to prime/pump some fresh oil through the engine so as not to crank it dry. After re-installing the fuses, it was the moment of truth. Motorvations Motorsports had created a basemap for me, so I uploaded that calibration into the Hondata s300 ECU, cycled the key off and back on three times to prime the fuel system, and then turned the key to start. The engine fired right to life !!! I was so excited. I immediately revved the engine up to 3000 rpm and held it there for about ten minutes... until the cooling fans cycled. I then shut the engine off. After waiting about thirty minutes, I repeated this process for a second time... revving the engine up to 4000 this time. After the car cooled, it was time to get her out on the Interstate and just drive to log some operational miles on the car. So I ventured out onto I-459 heading West for about 25 miles, turned around came back East until I merged on to I-59/20 and headed North toward Gadsden. Once there, I turned back around and headed back South... returning to Motorvations Motorsports after about 140 break in miles. 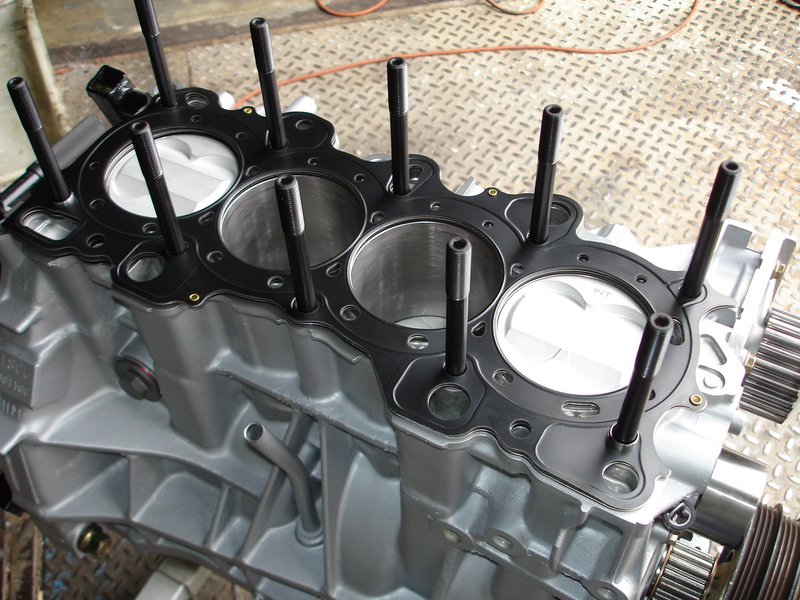 Once there, the oil was changed and the distributor timing was accurately set. Btw excellent job. Keep that supercharger small displacement flag flying high. I have always stayed in tune with your builds on jrsc and advice for my setup for the past 10+ yrs. I had a jrsc fully built sleeved block b18c1. Made 270/200 then a 50 shot dry nos. 11.9 /122mph. It mysteriously dropped a valve yesterday. Dont think I got up to 6500rpm. I havent viewed the carnage yet. I am in love the this set up but currently fearing the worse. Dont know the first move. Enough of my mourning. we are alike .we enjoy finding unorthodox ways of making that speed point. What are ur plans for the old setup jrsc.? Sorry to hear about your engine Grind. I hope that you get lucky and the damage is minimal. As for my old JRSC system... unfortunately, it is long gone. I sold it years ago. The old Benson's sleeved block was a nightmare... starting with a bad line bore/hone, followed by TWO dropped sleeves... essentially incorrectly pressed into the block and cut at the deck surface without being pressed all of the way down into the block saddle. Literally, the only parts that I have used on this new engine from the old engine are the Titanium connecting rods, oil pan and pickup, distributor, Throttle Body, cam gears, lower timing cover and FPR. Every other part of this build is NEW !!! I have to say that the results were surprising. Motorvations Motorsports did an amazing job on the tune and I couldn't be happier. When all the keystrokes ended, the engine idled like a stock car, revved through the powerband like a 600-750cc motorcycle, and rolled the DynoJet roller to 223 HP/150 TQ. Now it is time to strap the Supercharger to the engine and see what happens... stay tuned !!! Very good result for N/A, congrats. Which sleeves are you using? This block has the ERL Superdeck 1 sleeve package. I am not sure how much it would actually help when attempting to reach maximum supercharger speed at a specific engine rpm. In this example, using a smaller supercharger pulley would lower peak engine rpm so as not to overdrive the supercharger... and bleeding off boost would make the set value of the BLV your maximum boost level instead of whatever boost pressure the supercharger/engine combination makes at redline. It appears that the proper answer to traction issues is to slow the Rotrex supercharger to reduce torque across the entire powerband increasing traction... requiring fortified top end internals so that the engine can be revved to a much higher redline to make maximum boost.